Google AdWords is a highly effective platform from which to operate a pay per click marketing campaign. As one of the most frequented websites of all time, having your website listed on Google is like having a billboard posted for the world. If you can get your website a high ranking in a Google search, your chances of bringing in new customers increases to a staggering degree. Organizing and operating an effective AdWords campaign can be tricky if you don't have advertising experience. 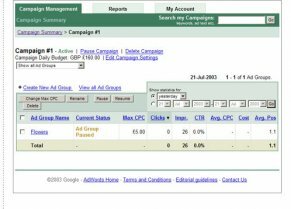 That is why hiring an AdWords campaign management company such as JumpFly is such a great idea. At JumpFly, we handle the whole AdWords campaign management process for you. We start by speaking with you about your goals for your business. Then, we analyze your existing website to come up with a list of keywords that best describe what you do. That's when the real excitement starts to happen. With our keywords in hand, our campaign management professionals jump right into action. We will custom design an AdWords campaign just for you. We will track the progress of that campaign, adjusting it as necessary to zero in on meeting your goals. You will also be supplied with frequent progress reports so you always know just where you stand.